For .uk based domains whois opt-out is easy, when you know how. You are not however allowed to use services such as namecheaps “whois guard” which essentially hides the whois information when someone runs a “whois” query on your domain. A whois query will return the personal information of the person who owns the domain, including there name, address, telephone number and email address. As can be seen the registrants details can easily be seen. For .com, .net, .me domains its easy to use a service, usually offered by the domain registrar to hide these details, however for .UK domains this is not allowed. There is a work around however, and you will not even have to pay anything extra like you would with a .com domain. If the domain is just been used for personal use e.g. a blog or a general website then you can whois opt-out to stop your personal information been show on whois query’s. 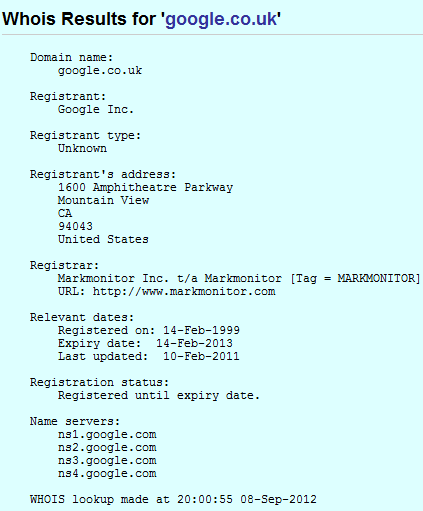 Basically when a .UK domain is registered, no matter who the domain registrar is the corresponding Nominet Online Service account is created automatically. Nominet is the .uk domain name registry in the United Kingdom and handles all registrations and disputes of .uk domains. 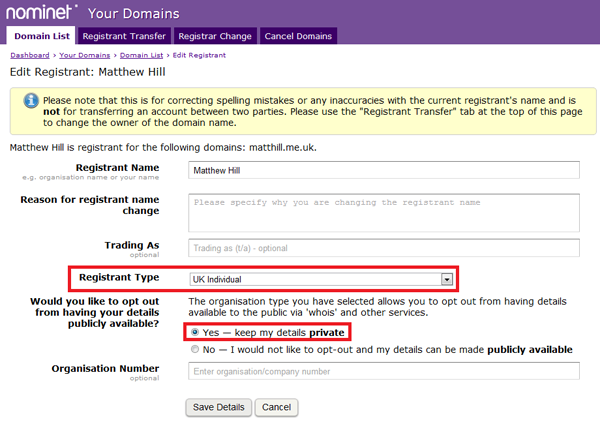 This account that is created when you register the domain will allow you to opt-out of having your personal information shown on “whois” searches, In order to get access to this account you can go to https://secure.nominet.org.uk/auth/access-your-account.html – Here you need to enter the administrative email address you chose when registering the domain, after doing so login details will be sent to that email address. As you are a non-trading individual you can opt-out of having your address details published, as can be seen below for a .me.uk domain I own. That’s it, quite simple when you know how! Just not that obvious if you have never been through the process before. The ability to stop spam is a problem, as a forum myself and a friend run has grown and become more popular over the years, so has the problem of spam to the point where it gets out of control. However an effective method does exist for vBulletin powered forums, best of all its a free plugin. When a user signs up there name, email and ip address are checked with the database on http://www.stopforumspam.com, if any of the details are in that database the users registration on the forum is denied. During the registration process the user is also required to enter a reCaptcha and answer a question such as “what would you put in a toaster?” It was believed this would be effective in stopping spam as any bot registering would most likely not be able to answer the question or complete the reCaptcha. Despite those measures every few hours the forum would be hit with a wave a spam which will be continually posted until the user account is banned. Even after a user has been banned that user could be seen on the active users list trying to create a new post, despite the user been banned for several months. It soon became apparent a person was likely registering accounts then using a bot to post spam after the registration had been completed and validated. Over the months we tried a couple of additional methods to stop spam which were really no use at all, however we then discovered the Keyword weight based spam detector for vBulletin. This product scans any new posts from members who have less than 5 posts (can be changed to save cpu usage) it will look for user defined keywords, such as “hotfile.com”. Every time someone types a banned word in their post that word counts as one point, when that post hits a certain number of points it will be denied. As all the warez / spam that get posted on our forum appears to be hosted hotfile.com, the word “hotfile.com” is now worth one point. The limit for denying a post is set to one point so any post on the forum with the word “hotfile.com” is now rejected. This has been pretty much been the end of our spam problems as the bots posting on our forum never appear to post anything apart from warez hosted on hotfile.com. If required in the future we could block other types of spam too. Beating domain squatters can be a problem, as i found out around 2 months ago. 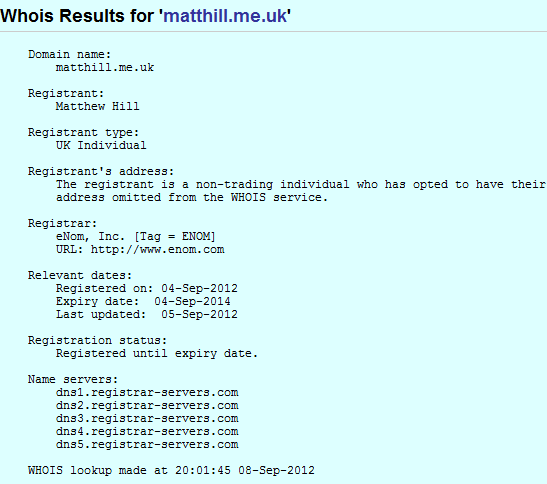 i decided I wanted my own domain, to use for email and not the @hotmail.com address I had used for years. I decided mattyonline was a good domain main, as it was my nickname with online at the end of it, so could be used for all things i did online. The problem was the .com of mattyonline.com was taken by someone who was just using it to display a page full of adverts, so I thought oh well and registered the mattyonline.net instead as it was free. What we do is take different measures to help you promote your brand on the Internet. Little things’ effectiveness can compare to securing .com to a domain with any other extension. Everyone knows .com, a lot of users will intuitively seek you at .com extension so don’t give a chance to anyone else to use that advantage of yours. Secure your domain right now! I thought to myself i bet he has registered the domain and wants £100’s for it, so i checked the website he had linked to and it turns out he wanted $100 for the domain. I never would have paid $100 for it as i refuse to help people make a living from buying random domains to sell on at insane prices. I then did i whois on namecheap.com to see when he registered the domain, it turned out the domain wasn’t registered to anyone so i instantly clicked buy and now own the domain I origionally wanted for $8.81!! Looking on Domain History Tools it appears the the domain had previously been registered for the last 10 years, with that in mind I think i was quite lucky to get it for $8.81! You could say the moral of the story is that it pays to check your junk email every so often!